One of the oldest, posh, buildings in the city belong to Berns, a restaurant and nightclub. Located at the end of Strandvägen and overlooking the beautiful Berzelli park (whenever they finish construction there) at the base of Östermalm, Berns is one of those places everybody goes to for something. 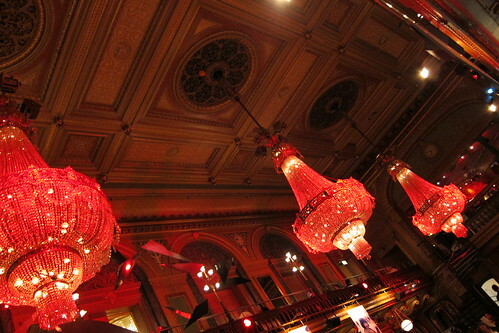 I’ve always been enthralled by Berns’ interior architecture. Entirely in the rococo style, the restaurant does everything to celebrate this late Baroque period: large gilded frames, huge chandelirs from catherdral ceilings, scrolled woodwork, and romantic lighting. Then, Berns does something entirely crazy and instead of offering a Franco-Swedish menu or similar, they went all Asian, East Asian. 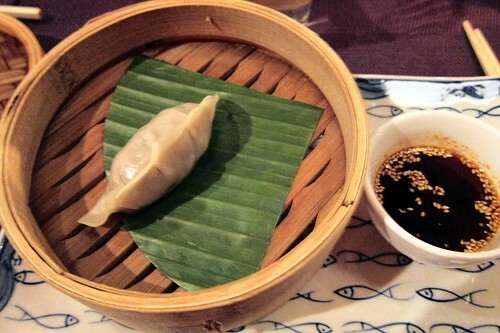 From dumplings to spring rolls to sashimi, Berns offers the best of East Asian dishes. On my first visit to Berns I attended a concert. Besides the fabulous architecture, entertaining unisex bathrooms, and overpriced drinks, it was overall a great night. The second visit was at the Berns Asiatiska brunch. 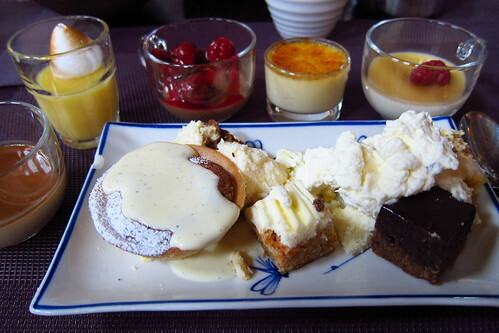 It’s pricy, 350kr, but with a full buffet of the same food served at dinner, a much better deal and selection. I also visited Berns for a birthday dinner, which is when things went terribly wrong. We had a night where Murphy’s law dominated our service and food experience. Our waitress arrived thirty minutes after seating to take our order. She skipped our drink order for another twenty minutes. In the interim, she explained that Berns serves its food family style; meaning, your orders can be combined and placed on a large platter to share. Normally, I would love to do a family style service but as I only know two people at the table and considering many servings were single piece only, our host informed the waitress that we rather have individual servings. She warned us that the ‘food will come out when it comes out’ and we agreed. What happened next was a nightmare. Several dishes were combined, especially the dumpling orders. Some people receive one, two or three of dishes with 45minutes of ordering, I for example, received nothing. At that point I asked the waitress where my food was, she had no idea and after another fifteen minutes, I received one of two dishes I ordered: a dumpling. Yes, a dumpling. ONE dumpling for 35kr (I swear I paid 32kr from the restaurant tax drop, but their website confirms 35kr). And when you are hungry and tired of waiting two hours from the time of seating, you are not happy. My chicken satay arrived a few short minutes after and the sauce was delicious but the chicken was rubber. My friend had the sashimi platter and said the sashimi quality was higher than average for Stockholm, but average compared to a good sushi restaurant on the US West Coast. As for price, acceptable but not amazing enough to go back repeatedly. A few other folks at our table never received some of their orders, only to find out that it had been ‘combined’ and served to someone else. The waitress did not inform either party. With the whole fiasco over, I went home fuming; eating a burger and ice cream to comprise a makeshift dinner. Two weeks later I received an apology from the manager. He asked some follow-up questions and a week later, explained that it went all wrong for them as well. He apologized, owned up to the mess, and offered myself, the birthday girl, and two guests brunch at Berns. I accepted and we went again. As a caveat, when I went to Berns for brunch, the maître-de met me and knew about the situation. However, service from her was impeccable and she was friendly and smiling. Good start! Our waiter, who served drinks, was prompt at refilling our teapots/coffeepots when necessary. He was not responsible for any food service since the brunch was a full buffet. As for the brunch itself, there was a full section of East Asian foods: cold salads, raw oysters with caviar or truffles, Thai green curry, dim sum, soft pork buns, cut of lamb, sashimi, and sushi. And a perfect brunch is incomplete without a dessert table. 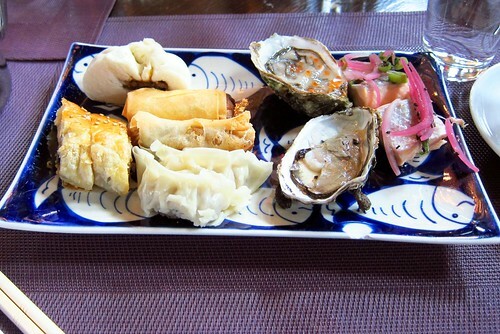 Favorites were dim sum – though could have been warmer, sushi, fresh scallops – which tasted like fluffy clouds, and oysters – which I ate for the first time. The dessert table was the highlight of the service. Dozens of mini mousses, brûlées, cookies, and cakes line the table. There was something for everyone. Delicate jasmine tea notes in a crème brûlée conclude the brunch service in a masterful way. Overall everyone was very happy, well fed, and feeling good. I take pride in a restaurant giving good service and this time Berns brought itself from the dead. If only restaurants gave their best the first time around, dismal evenings would not be had. Nevertheless, they owned up to their mistakes, offered a meal to give a second chance, and improved their reputation. That is real customer service. Overall: Brunch is absolutely a must for people loving Asian food. Afternoon tea is supposed to be excellent though have not personally tried it. Location: Berzelii Park; look for a large building across from the theater. I must say the desserts does look so good! All’s well that ends well. I hope they’re paying you for this ad. ‘Cause I’m definitely sold. @Ai – Yup! This was definitely was one of the dessert buffets I will never forget. @Tony – Except for the compensation for brunch, they’re not paying anything. :) Though I could always go for teatime!! Just want to point out that Berns certainly isn’t one of Stockholm’s oldest buildings – it was built fairly recently, in the early 1860’s. For comparison, the oldest building in the Greater Stockholm Area is Bromma kyrka (church), from the 1160’s. In the Inner City, I’d guess it would be Riddarholmskyrkan, built in the late twelve-hundreds (though it’s been added on to and changed much over the years).